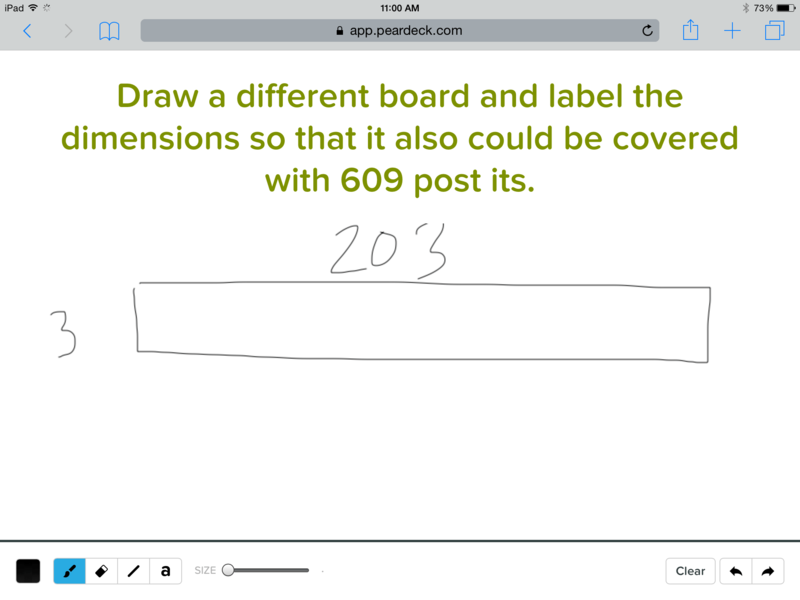 R2D2 – Pear Deck/Desmos Mash Up! School is just right around the corner for us up here in Ontario and I can’t stop thinking about that first day. As for my grade 9 applied class’ first day I have ran the R2D2 problem in the past with great success. Now, over the summer I’ve seen great improvements in Pear Deck and wanted to get into it! Also Desmos has been busy and released Activity Builder!! So let’s mash these two apps up with some R2D2!! So here is the R2D2 problem presented with Pear Deck and an extensions with Desmos…. 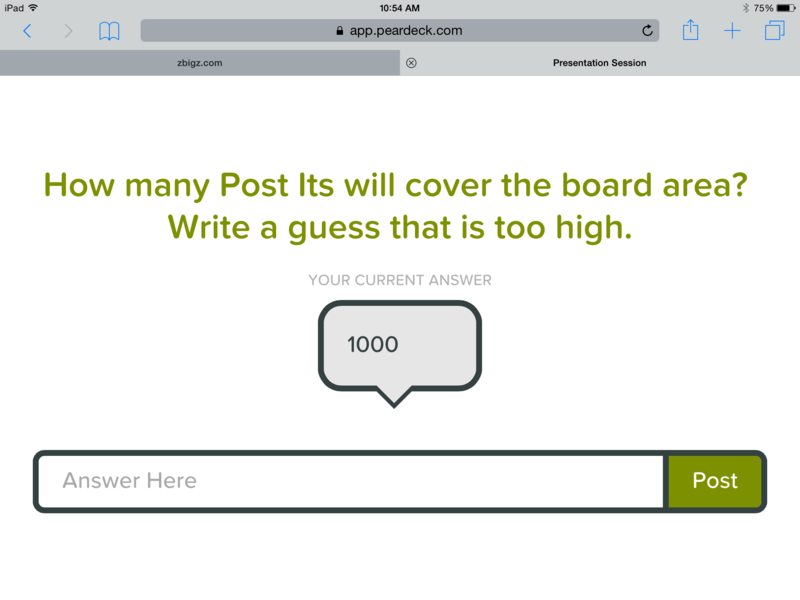 and this is what Pear Deck will show after you insert the video…..love how the video will be displayed on the projector and not on each individual device!!! 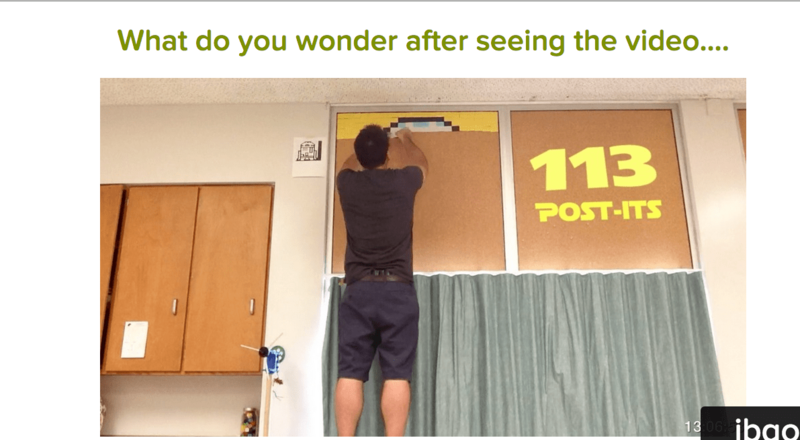 I like using Pear Deck here for asking for wonderings and notices because it allows students who normally won’t shout out answers to have a voice in the room. Students get to input their responses and the teacher can show them on the projector. For generating estimates I absolutely love how they put our Too high and Too low guess on a number line…..it gives us the visual of where our actual estimates will lie. 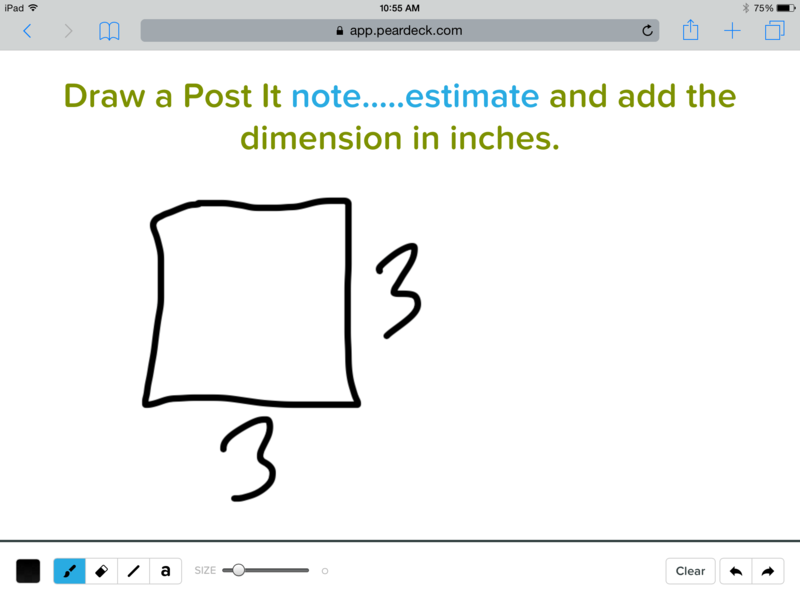 In the new version here I get students to draw their estimates of the dimensions of both the board and the post it note…..this pushes them into drawing diagrams. Students are ready to solve…. The Extension: How many rectangles can we make that have an area of 609 post it notes? To extend I want students draw out different rectangles and label their dimensions! 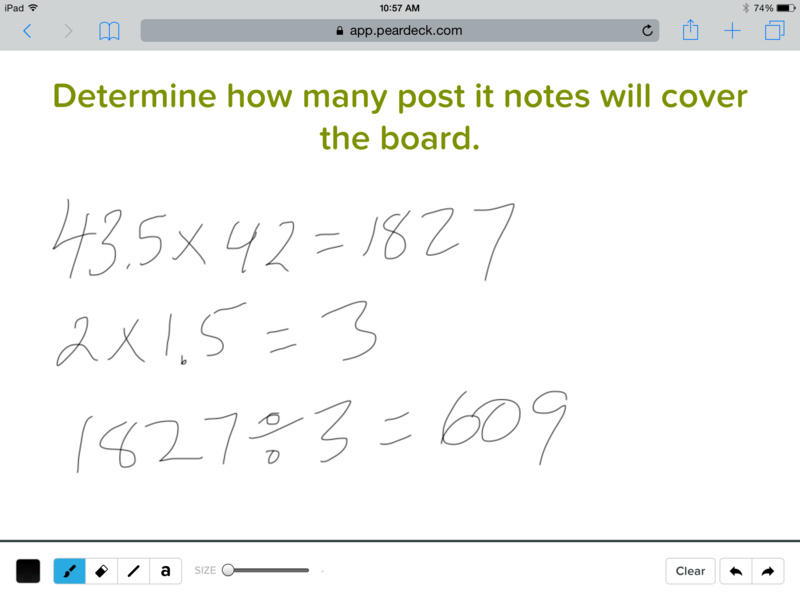 They can use Pear Deck’s white board! But then they can enter them into Desmos through a pre-made activity I created in Activity Builder. 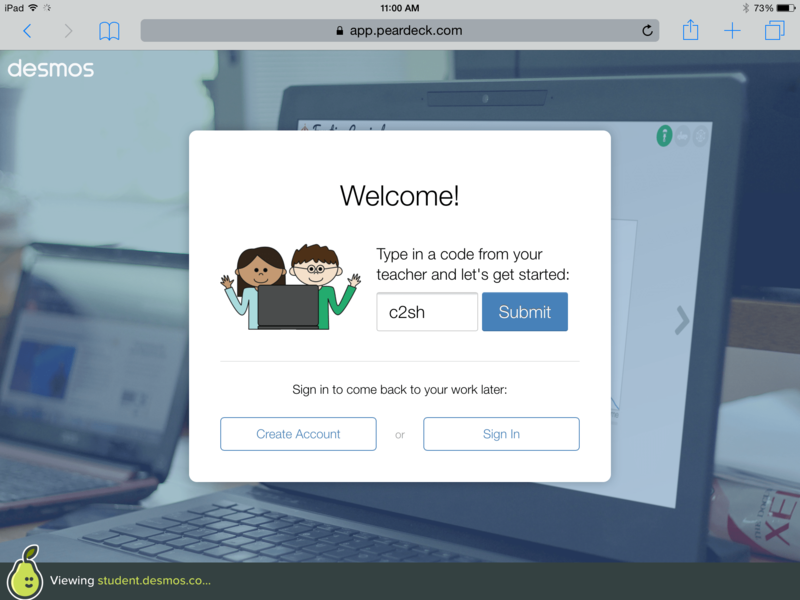 (the Pear Deck file links to the Desmos activity). For each rectangle the student can come up with they find the perimeter and plot the length vs. perimeter in the Desmos graph. The teacher on the projector can use the Overlay function and show all the different rectangles students are coming up with…essentially showing the pattern that emerges! Using the pattern students can read off the minimum perimeter! If you have a Pear Deck account Grab and download the file below! Love this! I am doing a Math Tech PD next week, using Pear Deck (first time) as my platform, and introducing teachers to DESMOS, Geogebra, estimation 180, Visual Patterns, and Which One Doesn’t Belong? I am interested to see how the “flow” goes. I only have the “free” version of Pear Deck, though. Overlay feature of DESMOS Activities will be interesting to play with as well. Thanks for the comment. Your Tech PD looks like it will be awesome! So many great tools and websites you are showing! Hi Jon! This is a great activity and I’m really looking forward to using it as an Icebreaker in my Algebra 1 classes. I do have one question though related to the Desmos Activity. You started with a point plotted (21, 29), the dimensions of the rectangle with an area of 609, however, you asked the students to state the perimeter of the rectangle as the y-value. I’m curious what the the point is not given as (21, 100)? Thanks for creating such an amazing activity! Hmm. Maybe a mistake? I just checked this Desmos activity that is linked from the post and it seems to have the point (21,100) plotted. Thanks for looking into this! Thank you! I accessed your PearDeck file for this activity off of the PearDeck site instead of your blog, so that may explain the problem too. Thanks for clarifying!